To the left of Rêve de Pierre, on the boulder marked "F", along the blue path n°12. Sitstart completely left, climb the overhang and exit above by a mantle. NB: rediscovered by Pierre Collantier. Update (May 2017): the shaky hold right hand in the face has recently broken off but the problem is still possible with a dynamic move. 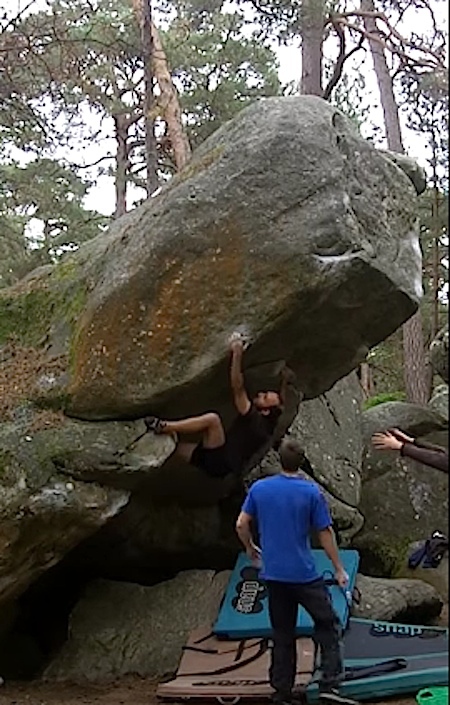 Chute est autour de 6c+ debout et 7a+ en départ assis avec le bidoigt main gauche.